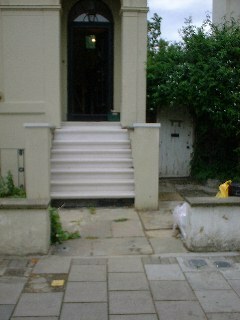 Front wall of our house before new railings were fitted. 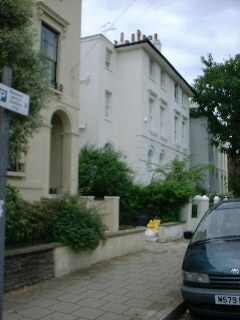 The surviving railing visible in the right hand picture is between the front garden and the area. A 1903 photograph of our street shows that the houses on both sides had railings between their front gardens and the pavement. The photograph, which I only have in print from a scanned copy, is not clear enough to show the design of the railings on our side of the street nor does it scan well, so I have not included it here. 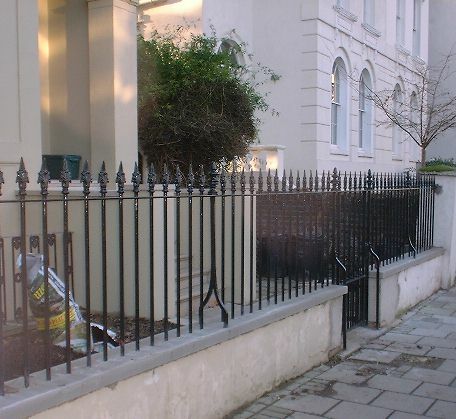 Few if any of the original railings survived the second world war but in 1938 a number of photographs were taken of houses on the other side of the road. A copy of the one which shows the clearest view of the railings is included below. 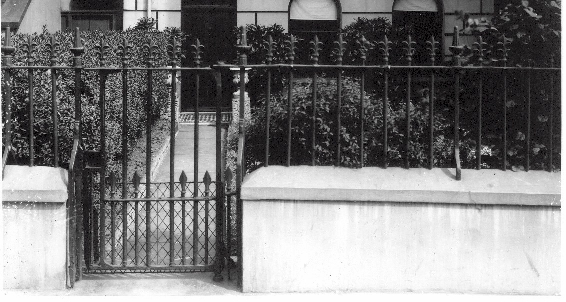 Railings of Albion Lodge on the other side of the road photographed in 1938, shortly before their removal. 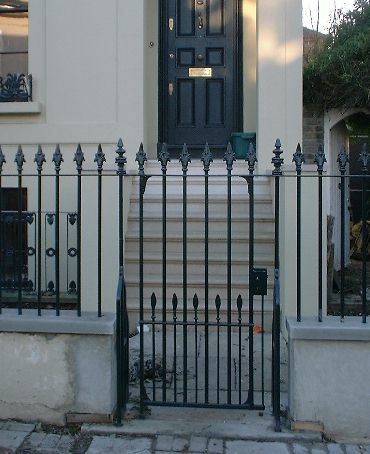 This photograph gives a very clear idea of the how the railings and gate were constructed. 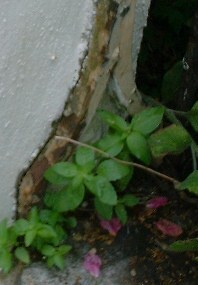 The top of the wall appears to have been cemented and built up into an inverted "V" at a later date. It is interesting to note that one of the finials is different from the rest, no doubt because of a later repair. An unusual feature of this railing is the way the posts are formed into an inverted "Y" at the bottom. The bottom gate pivot is embedded in the paving. Also embedded into the paving is the bottom of one small spear. The top is attached to the gate post by a short length of rail. 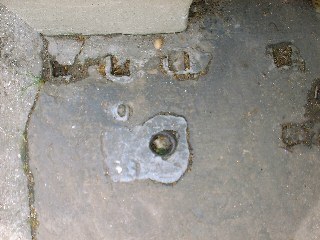 The original gate post holes could still be seen in the paving slab in front of our house. Our house still had its original York stone paving leading up to the front steps and our next door neighbour in the mirror image of our semi detatched house has what appear to be the original York stone copings on the wall above which a modern railing has been fitted. 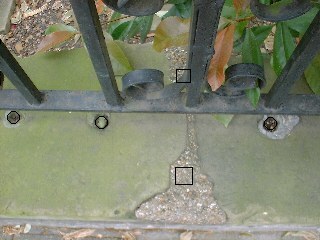 The position of the post holes strongly suggests the same configuration of gate and railings that can been seen in the photograph of Albion Lodge except that on our house the gate was hinged on the left rather then the right. The one confusing aspect of the gate post holes was the position of the gate pivot which were out of line with the centre of the three gate post holes and the spear hole (in Albion Lodge's they are all in line). Anthony Thompson Smith, the metal worker I have engaged to make new railings, believes this may be the result of a later repair or alteration. If one looks closely at the photograph one can see that the lead-filled hole is large and extends to where the pivot would have been if it had been in line. A sole surviving post two houses away. Note the inverted "Y" shape. This house has Portland not York stone copings. The wall in front of the other half of our pair of semis has original stone copings. Conjectural position of post and railing holes marked. 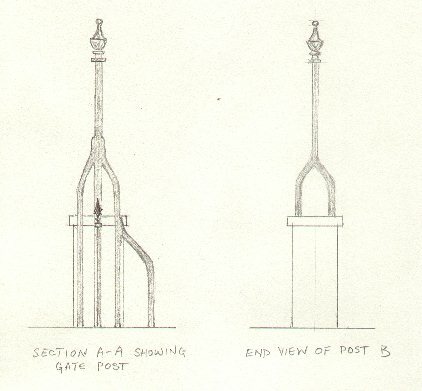 I drew up proposals for a new set of railings. The configuration is based closely on that of Albion Lodge but in the absence of any direct evidence of finial design on our side of the street I have opted for a different design. The railings have now been largely completed. 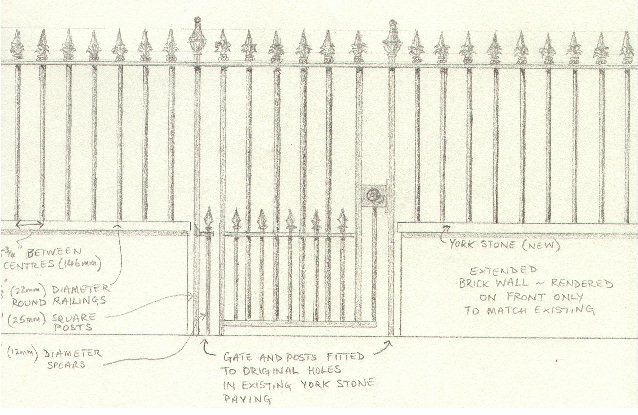 New York stone copings were needed for the front wall and a new threshold was needed for the gate as the original stone was too broken. Images shown below. Some work is still needed on the gate.